Rich Casino gets straight to the heart of the matter with that name. If you want to get rich then play here – or at least that is what it would like you to think. Whether this casino will make you wealthy or not is certainly up for debate. However, it is one of the better casinos aimed at the U.S. market since at least it offers a very good selection of slot games. The welcome bonus offer is not bad either, except for the fact that it is capped at $100 in winnings which can be withdrawn. There is still enough to like here to make it worth checking out. 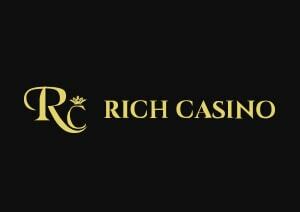 Rich Casino is owned by the Blacknote Entertainment group and has been in business since 2008. Blacknote are certainly no strangers to the casino industry, as they also operate other casinos such as Slots Village, 7 Spins Casino and Casino Moons. With that much experience you can expect to find a comprehensive casino experience on offer here, and that is exactly what you get. There are lots of slots, table games and even a live dealer casino on offer at Rich Casino. Plus, you get 25 free spins on top, which can be used on a selection of different games. However, be warned – there is a catch. It doesn’t matter how much you win with your bonus funds or how much you wager, you will still only be able to withdraw a maximum of $100 from bonus winnings. Credit and debit cards are a popular method to deposit to online casinos, and AMEX, Visa and Mastercard are all available here at Rich Casino. Alternatively there are many bank transfer options as well as electronic wallets like Neteller and Skrill. For US customers who may have problems with traditional funding methods due to banking restrictions, there is the welcome option to use Bitcoin to fund their accounts as well as to make withdrawals. There is a withdrawal level of between $4,000 and $35,000 per week in force, and this varies according to the VIP level of the player. Note that complaints have been reported regarding slow payout speeds from this casino. Perhaps the most surprising aspect of Rich Casino – in a good way – is that it offers a live dealer casino. This is by no means a given when it comes to US-facing online casinos, so there is no doubt that this will be much appreciated by American players. There is an FAQ section at Rich Casino to answer some of the more common questions but failing that you can contact the support team directly. Get in touch via live chat, email or by calling direct. The support team is available at any time of day or night 7 days a week. They are standing by to answer any questions you may have and are happy to deal with any complaints or queries. Our overall impression of Rich Casino is that it may look a little old-fashioned, but it provides some compelling reasons to sign up. Not least of these is the very generous selection of games, even though most of these do not come from the more highly-rated developers. The welcome bonus sounds incredibly generous -at least until you read the small print and find you cannot win more than $100 from the bonus. However, despite that there are enough reasons to like Rich Casino. Rich Casino is hardly a ground-breaking online casino, but it does offer a very good option for American players who are hardly spoiled for choice. While European players may prefer to look elsewhere, it cannot be denied that Rich Casino is one of the better options for US players. Although it’s mainly about slots, there is a reasonable selection of table games and even a live dealer casino. Add in some tournament play and lots of promotions and there are enough reasons to try and see if this casino can really make you rich.